My sister posted some thoughts on her blog this week about discovering how different she is. It was a great post! With her permission, I am sharing the link here. It got me thinking about what “normal” is. As I thought about it, I became so grateful that I too am different, that I wrote a thank you letter to God. I thought I would share that with all of you today. Thank you that I am not “normal”. Thank you that I don’t fit in with the rest of the world. Thank you that I am beginning to revel in my differentness and embrace my uniqueness instead of seeing them as flaws. Thank you for telling me that I’m supposed to be unique, that you created me to be unique and not a copy of someone else. Thank you for the gifts and talents and passions that you placed in my heart and soul. A different combination of gifts and talents and passions from anyone else who has ever been or ever will be. Thank you that I don’t have to conform to the expectations of others who are offended by my uniqueness. I don’t even have to conform to my expectations of me that come from any source other than You. Thank you that You created me with a unique purpose and a unique destiny that only I can fulfill. Your Word says that You know the plans You have for me, and those plans are different from everyone else’s. Thank you that I am finally able to begin to slough off the person that everyone else thinks I should be and discover the person that You created me to be. Uniquely yours, a grateful daughter. One of the blessings of fall is apples. Lots and lots and lots of apples. 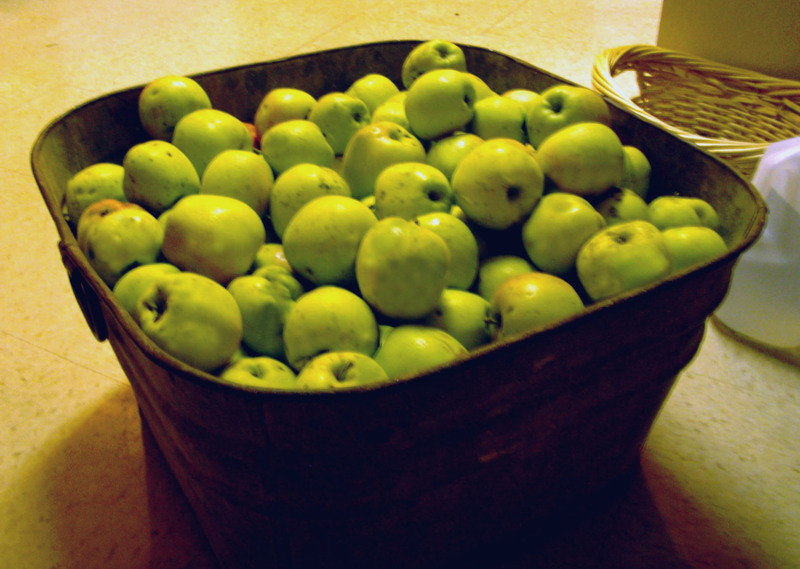 I was blessed this year with about 40 pounds of apples! This is what they looked like when I got them home. This tub is about 3 feet square and 2 feet deep. And this is what they look like now. 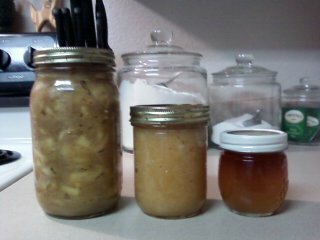 So now I have quart jars of apple pie filling (for pies or crisps or pancake topping or ice cream topping or…), pints of applesauce (for just by itself, or for a really amazing spice cake recipe), and apple jelly (for toast or syrup) enough for at least a year. Well, maybe not a whole year. I plan to use some as Christmas presents. With appropriate recipe cards and ideas attached. Oops. Those of you on my Christmas list, pretend to be surprised, OK? Say it with me now: Oooohhhh, aaaawwww. Very good! I will add these to the bounty of my canning pantry. They will join the tomatoes and peaches and blackberry jelly which are also all products of blessings. And hopefully, the fall beans and peas that are happily climbing the back fence will yield enough to add to the shelves. So, the pantry is full and the freezer is bursting at the seams with venison and chicken (also blessings). And some time this winter I will make venison stew with vegetables from my pantry, add a fresh crusty loaf of homemade French bread, and make an apple pie or a peach cobbler for dessert. And I will be reminded once more just how blessed my life truly is! This can be left in powder form or made into a liquid. I have used it both ways and it always works great. I prefer to leave it in a powder simply because it takes less room to store that way and my laundry area is REALLY small. The Borax and the Washing Soda are in the aisle with the laundry supplies. Make sure that you get Washing Soda not Baking Soda. The only brand I can find here is Arm & Hammer. The soap that you use is completely up to you, but try to find one that is dry if you want to leave the soap in powder form. You can use one that isn’t dry for powder, but that adds another step which isn’t hard, just takes more time. The soap I use is sometimes dry and sometimes damp depending on the weather. I like to use soap without dyes or fragrances. Here’s what you do. Measure the Borax and the Washing Soda into a medium sized bowl. Use a cheese grater to grate the soap. If the soap is dry it will crumble, if not you will get shreds. If the soap is dry, just mix it into the other ingredients. Voila! Laundry powder! Pour it into a container and continue with your day. Use 2 tablespoons of the powder for a normal load, more for really dirty stuff. If you want powder and the soap is not dry, spread the shreds onto a cookie sheet and put it in the oven at 200-250 degrees until it dries out. I like to put a piece of parchment paper on the cookie sheet so nothing sticks. After that, crunch it into powder and add to the other ingredients. I put it in baggie and use a rolling pin to crunch it up. The soap I use gave me 2 cups of powder. With 4 cups of ingredients I get 32 loads out of each batch. Measure the Borax and Washing Soda into a medium sized bowl. Use a cheese grater to grate the soap. For the liquid it doesn’t matter how dry the soap is. Heat 4 quarts of water in a large pan on the stove. Do not let it boil. Add the grated soap and stir well. Continue stirring, without boiling, until the soap is melted. When the soap is completely melted, remove from heat and add the other 2 ingredients and mix well. Pour 2 quarts of hot water into a clean 5 gallon bucket. Add the soap mixture and mix well. It is really important that everything is really well mixed to distribute the soap evenly into the water. Add more water a little at a time and mix well until the bucket is full. Continue to stir the soap periodically as it cools. When cool, it will have the consistency of applesauce. You can store it in the bucket as long as it has a lid, or transfer to leak proof, non metal containers. My sister puts it in canning jars. Use 1/2 cup for a normal load, more when necessary. If you want to add fragrance to your laundry soap, make sure that it is for soap making. Add a total of .5oz of fragrance. For the powder, drizzle over the completed mixture and mix in well. For the liquid, add it to the hot water in the bucket when you add the soap mixture. Or, you can just use a scented soap. If you are interested in the math, here it is. This is the math for the powder. The liquid makes 5 gallons. At 1/2 cup per load, you get 40 loads. 1.26/40 = .03 cents per load.